It's time for another fun challenge here at the Raisin Boat Blog! This month, we want you to show us how you dress up a treat. It can be a box, tins, bottles, or just cover a candy wrapper. Raisin Boat offers a great selection of fun alterable products, if you're looking for something to "dress up" with your stamps. Check them out here! They make perfect goodies for Halloween and Christmas, which will be here before you know it! I used a Raisin Boat Clear Pillow Box Small. I stamped the eyeball from the Halloween All Around set on Brighton Beach White cardstock and wrapped it around Smarties Candy and put them in the pillow box. 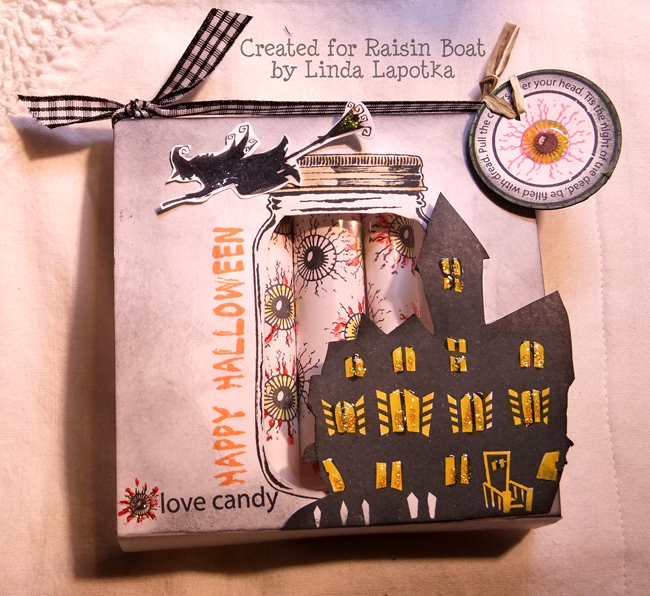 Then I used Sealed with a Kiss to stamp the jar and the set Do Not Enter to create the spooky treat box. The ribbon is Raisin Boat Gingham 1/4" Black/White and Rafia Natural Mix. I love working with the raffia, it is great stuff. This month... you can use any stamp set you have (you don't have to limit your entry to Raisin Boat stamps). That's right, use any stamp set you wish for this treat challenge, but if you use a Raisin Boat stamp set, it will count as two entries. That gives you twice the chance to win a stamp set of your choice! Something NEW this month... To get three chances to win a free Raisin Boat stamp set, invite a friend to play along with our challenge. If you get a friend to enter the challenge and he or she mentions your name, you will get your name entered three times and triple your chance to win a free set! 1. Your name is entered once for joining the challenge. 3. Your name is entered three times if you do 1 and 2 and get a friend to join the challenge. I hope you will join the challenge this month at the Raisin Boat Blog. You could win a stamp set of your choice. The hard part will be picking out the set when you win. Here is how I made my treat box. If you need more inspiration be sure to check out the rest of the design teams creations. I loveeeeeeeeeeeeee this!! LOVING the way you cut out the mason jar and loveeeeeeeeeee the house!!! Wow, I am loving that jar....so realistic looking! And of course, who wouldn't love the project, too! Sweet & spooky! This looks awesome my friend. I really love those eyeballs, looks amazing. This is super cute Linda! Love the eyeballs. Linda this is just fantastic LOL I love the little eyeballs!! A perfect Halloween creation! 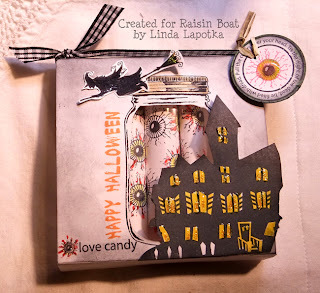 Hi Linda this is a brilliant little gift box, I love the Halloween decorations and stampings, not sure about the eyeball, lol, superb work as always. nice job Linda- really cute!